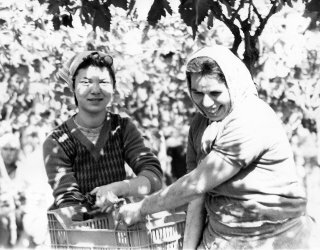 Over the years, with the gradual specialization in wine producing culture, both concerning the care of the land and arbors, along with the ongoing improvements in the development of new facilities has contributed to a better treatment of grapes; a better care that guarantees a healthier wine production. That is there are no traumas either weather or mechanically related. The wine making process entails the use of grapes that have been hand picked and never by machine at the same place where they are soon after processed. Thereby, the fruit avoids the damaging trauma of senseless tears and violent lacerations, not to mention long hot suffocating trips to a processing plant a noble and elderly conclusion, all the time protected in a temperature regulated home. Nuova Vite harvests its grapes and within minutes, while they still posses their maximum level of fragrance, they are peeled and the miracle of their transformation into wine has begun. Not long after, the product is allocated to the cellars located under our facility. There, like all living things, the phases of maturation unfold: from youth onto maturity and finally a noble and elderly conclusion, all the time protected in a temperature regulated home. Our team of experienced and knowledgeable operators in cellars must decide on the best bottling times. These decisions are carefully made, taking into consideration the specific and diverse characteristics of each wine. 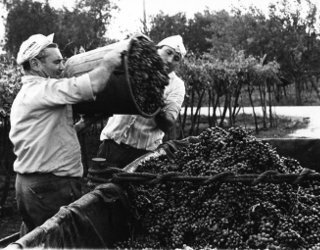 This, as with all of the previous phases in the realization of the wine, takes place at the Nuova Vite facility where the vines grow.